GRIMACING Leonardo DiCaprio is forced into a supporting role - as he hobbles along on crutches with a suspected broken leg. 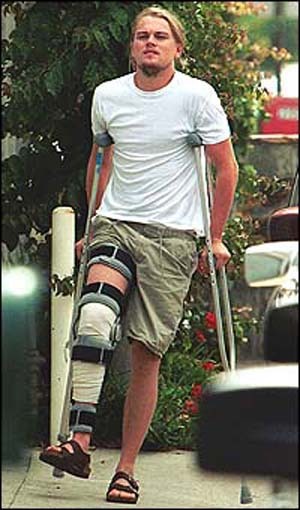 Leo, 26, was strapped up from thigh to ankle as he struggled from a car into his mansion in Malibu, California, after a mystery accident. The star - who also had two bandaged fingers -managed the feat. He's the stuff Hollywood leg-ends are made of.